Park Slope artist Susan Steinbrock isn’t afraid of color. Her new collection of collages made from bright, geometric strips of paper is inspired by the era of “Mad Men.” She started making the collages last winter while recovering from a broken knee, after almost 30 years of hand-painting textiles. Steinbrock cut and pasted all winter, completing about 40 collages before getting back to her other job as a gardener in the spring. Two of the collages have been translated into a collection of handwoven rugs, produced by Brooklyn-based rugmaker Classic Rug. 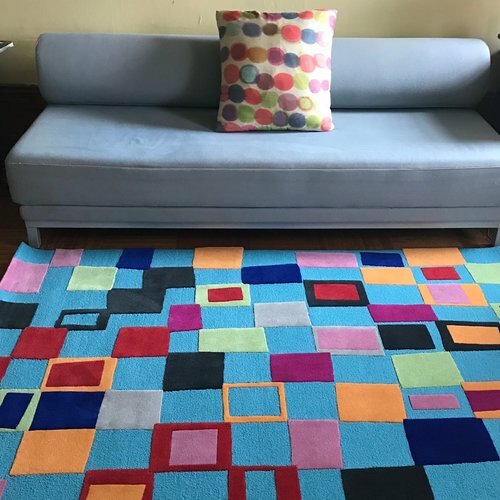 The rugs are made to order in Thailand from New Zealand wool and the company will produce six rugs per pattern, with the possibility of adding more patterns to the collection. To make the rugs, a pattern is drawn on a piece of monk’s cloth, a thick fabric used for weaving, and stretched on a frame. Then, each stitch is added with a hand-held tufting gun, Barran said. The stitches are secured with latex and jute, and the edges are bound with cotton canvas. 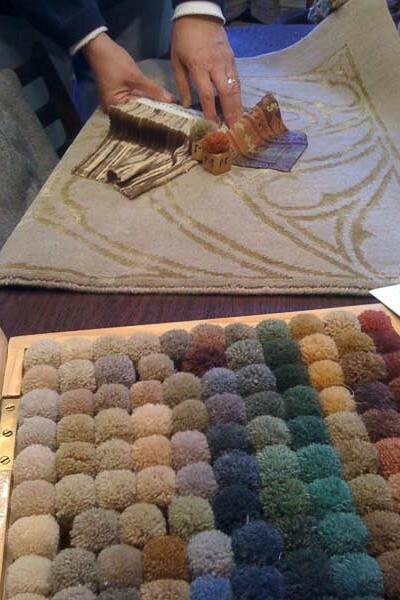 The surface is then sheared and hand-carved, then the rug trimmed with a pair of scissors along the edges. A 4.5-by-6.5-foot rug from Steinbrock’s collection, available at Susan Steinbeck Design, costs $4,700, but prices vary according to size. For those with a smaller budget, Steinbrock also sells the original collages on her website. A 20-by-25-inch collage costs $500. But Steinbrock mainly created the collages as prototypes for rugs and wallpaper. The artist also has a line of wallpaper based on the collages. “The rugs are very playful, so I think they’d look great in a child’s room,” she said.